Just a typical Donald Trump tweet, filled with hyperbole and random capitalisations. The threat of invasion looms ever closer, it seems. The President’s obsession with building a country-wide wall along the Mexican border to ‘stop immigrants’ has not diminished since he ascended to the highest seat of power. His plan is not a novel one; Hungary and its Eastern European neighbours have erected barriers topped with razor wire to stem the tide of refugees arriving from the Middle East for instance. But the idea sits uneasily with what America is supposed to be: the land of the free, the land of immigrants? There is symbolic potency in Trump’s grand vision – however muddled – but what will it actually achieve? Looking at history, the omens are not promising for the President and his chest-thumping brethren. Never has a physical barrier carried such ideological weight as the Berlin Wall. Constructed almost overnight in 1961 by the Soviet-backed East German government, it became the defining symbol of the Cold War: Capitalism vs Communism. Good vs Evil. It was perhaps also the greatest propaganda misfire of the Soviet regime. As soon as the Wall went up those yet to decide on their allegiance in the Cold War – and you had to pick a side – veered towards the West. How could you physically separate a people? It looked like a horrible retribution for World War Two (WWII). That more than 5,000 defectors successfully crossed into West Berlin during the existence of the Wall also speaks to its strategic failure. When the first boulders were hauled down in 1989, the world rejoiced. One can imagine parallels with a Trumpian wall; the brutal eyesore, the separation of families, the ideological statement of exclusivity and isolation. One can also imagine it being hauled down; ad hoc, with ropes…Saddam Hussein in Texas. 28 years is a long lifespan to emulate. If Trump really is seeking to avoid the ideological and symbolic connotations – and it’s difficult to see how he can – then what of the practical elements? Will his wall dam the flow of illegal immigrants, of drug traffickers and fugitives from justice? From the 7th century BC until the heady days of the Ming Dynasty, the Chinese embarked on an engineering marvel that continues to wow visitors to this day. The Great Wall of China stretches some 13,000 miles, specifically built to prevent invasion from the windy steppes to the north. It was not built as a single entity, rather in stages and as it was required. In addition to its primary purpose of defence, the Great Wall helped control the flow of trade, administer taxes, emigration and immigration. Trump must be an admirer. But policing a 13,000 mile stretch of property had its obvious logistical difficulties, even for a country as populous as China. The invaders were not repulsed – indeed the Mongols would conquer China and create a dynasty – and as sections of the Great Wall fell into disrepair and the costs of reconstruction became increasingly prohibitive, the border pores opened up. The beauty of China’s Great Wall draws 70,000 visitors per day. How many will visit the ruined facade of Trump’s monstrosity in 50 years’ time? Trump’s wall will be a tenth of the size and, if he gets his way, he’ll have the money and manpower to ensure that its construction is sturdy and its posts constantly manned. But so what? Border guards can be bought, as they are now. Who can truly stop corruption when the riches of the Cartels are in play? The costs of loyalty will be astronomically high, the endemic paranoia of Trump’s administration always likely to fear betrayal. Trump sees his wall as a symbol of American power and prestige. Some would argue that China’s Great Wall demonstrated a civilisation of incomparable strength, at its zenith, with the resources and the tenacity to engage in such an undertaking. 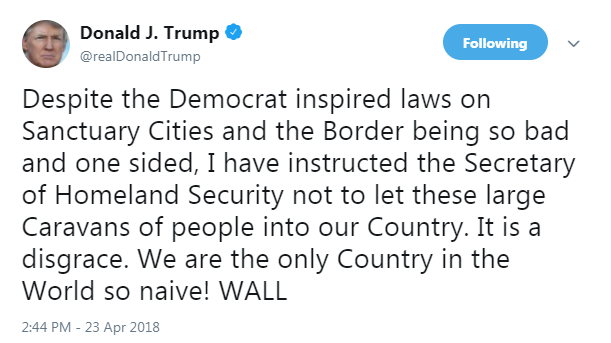 But a wall is essentially a defensive measure. It is a sign of weakness, particularly where America is concerned. There are no armed invaders lurking on the borders. Should such an unlikely scenario ever occur than the US military could destroy it without even having to travel to the national boundary. Ultimately it is a move of insanity; an expensive, divisive, symbolically damaging and egocentric waste. Yes, illegal immigration is a problem to be tackled, as is the trafficking of narcotics. But this should never happen. It makes no sense. History should warn him. His wall will be torn asunder by the next generation. It is not America. It is foolish and angering and it will fail in every sense of the word. Viktor Orban’s third successive election victory has led to warnings that this self-styled ‘illiberal democrat’ will remove Hungary from the yoke of the European Union (EU) for good, upsetting the harmony of the regional bloc in the process. Adding to his crackdown on the free press, the independence of the judiciary, and the NGOs and universities linked with George Soros, Orban has set his dictatorial course. He has even promised retribution on those who opposed and mocked him during his latest campaign. The most notable facet of Orban’s recent rule has been his vehemently anti-migration stance, which have directly contravened the hopes of the EU in general, and Angela Merkel in particular. Border walls have sprung up and asylum seekers been turned away as Orban warns of a ‘Muslim invasion’. To him, Hungary is for Hungarians…that is, Christian Hungarians. This stark message has seemingly engendered popular appeal, even more so than his Fidesz party’s efforts to boost growth and employment after years of economic stagnation. Perhaps the Hungarians remember their history. Orban is certainly doing his best to make sure that they do. It was in the 16th century that the mighty Ottoman forces of Suleiman the Magnificent plundered into Medieval Hungary, capturing Buda in 1541 and establishing Turkish overlordship across much of the kingdom. During their period of rule, the Ottomans committed the sorts of atrocities typical of distant sovereigns. Deportation and massacres significantly reduced the ethnic Hungarian population, whilst the economy of the territory was allowed to slump into ruin. Buda, a once magnificent medieval citadel, became an impoverished backwater. Likewise, Orban can see in himself, and the other members of his Visegrad Group, a Christian bulwark to Muslim invasion, comparable with the Holy Roman Empire. It was Habsburg forces, along with their Polish allies, that finally ran the Ottomans out of Hungary in the late 17th century. A victory for Christendom over the evil forces of Islam, invoking the spirit of the earlier Crusades. Of course all of this is somewhat ridiculous. Hungary has a population in decline (30,000 a year), with many frustrated citizens emigrating in the hope of finding better life in other European states. What an influx of youthful labour could do for an economy reliant on state employment and a low-skilled workforce. Orban, however, is both stubborn and resilient, not to mention manipulative and vindictive. Everything he does is geared towards maintaining power and moulding the Hungarian state into a compliant tool for exercising that power. It is sadly ironic, for this is a man who rebelled against communist rule in the name of democracy and imbued a generation with hopes of inclusive and free politics. By defying his former self, and ignorantly casting Muslim migrants as bloodthirsty successors to the Ottoman Turks, Orban is threatening to isolate himself. The EU will not stand for continued disobedience – however ponderous and pithy its mechanisms for meting out punishment are – nor can Hungary live without its generous subsidies. Russia and its ailing economy can hardly be expected to fill the gap this leaves. Populism, nationalism and authoritarianism can paper over the economic and political void for only so long. For Viktor Orban the test will be to come up with a new enemy when he seeks yet another re-election in 2022.